The couch that was caught on fire. A fire can start in many ways, a kitchen fire, bad wiring, or maybe even a candle. For this case a candle was knocked over by a cat and burned a couch. The couch catches on fire and burns a hole in the wall. The damage didn't stop there. Smoke damage and soot was though out the house. SERVPRO team arrived on site to began the clean up. Over the next couple days, the SERVPRO team began to box up all items into boxes and brought to the warehouse for deep cleaning. On site was a full house cleaning, removing any soot and smoke damage to the house. Walls and ceilings were sponged to removed soot and wet cleaned with SERVPRO approved cleaning products. Back at the warehouse, each boxed is opened and cleaned deeply. Once all is set and done with approval of the customer. The house was back to normal. "Like it never even happened." What a pipe break will look like when it was frozen then burst. On January 30th 2019, Chicago land area hit a record of the coldest in Chicago history. Temperatures reached a stunning Negative 50 degrees with the windchill. Even going outside for longer than 5 minutes can cause a problem with health and safety. With this type of weather can also cause problems with homes and businesses. Pipes can begin to freeze and cause damage to the home. This became true when ,3 days after the historical weather, temperatures hit from -50c to 50f. This jump in the weather will cause the pipes frozen on the 30th to defrost and burst. This became true when more and more houses began to call in needing SERVPRO teams to come in and fix the problem. Houses were seeing up to 2-5 pipe breaks in the house. SERVPRO teams are always ready for what the temperature will bring us. If you had a fire, you might have cleaned up anything damage of any soot or brunt items. However that does not mean you are safe from breathing in soot or smoke for good. When a fire happens smoke and soot rises. So for example the fire happens in the kitchen and you live in a multi level home. The smoke and soot from that fire will rise and go the second or third floor of the home. Smoke rises, so drywall and content from above will be damaged. SERVPRO can come in and make sure the house is safe and protected from any safety hazards. SERVPRO will come in and remove smoke and soot from the home. SERVPRO does this by using sponges on the ceiling and walls to remove soot, then using chemicals cleaning the same. Content will be cleaned as well. SERVPRO is high skilled at cleaning and protecting a home. In action shot of the class in progress. Each morning the SERVPRO team gets together and goes over the day ahead. Also in the morning, will go over a topic to help us better understand equipment and chemicals. In this picture we are going over the different types of mold chemicals we would use on a job. Most of the time other techs will ask questions about what we are learning. This helps to learn more about the item we are talking about. Each week we go over a different topic. Learning something or having a refresher on a piece of equipment/chemical gives us a better understanding on what we are using. This also gives a chance to have other people talk about something they dont know. Having a class in the morning helps that we are ready for the next job ahead. Mold is always hiding. SERVPRO can come find it! Mold can grow anywhere. In this picture you can see that mold was growing behind the baseboard. Mold can grow were water once was. If you had water before and cleaned it up, you might have a chance for mold. Calling SERVPRO is the best bet to find out for sure. SERVPRO will check for mold, and treat it if mold is found. SERVPRO is a highly skilled team that is very knowledgeable when it comes to mold and mold remediation. The chemicals we have are the prefect job for keeping the house in top shape. We are able to take on any mold job given to us. No matter how big or how small. SERVPRO will be sure you are in good hands and let us do the rest. "Like it never even happened". Top mold killer for big mold jobs! When mold is at its worst. SERVPRO crews will take the top care of the job. In some cases strong chemicals will be used. The chemicals in use are called RMR. We have two types of RMR, 141 and 86. In the steps taken to remove strong mold, it starts with preparing for the job. Putting on a full suit and a full face mask. The smell and the chance that the chemical can get on your skin is something we don't want to risk. When using these chemicals we must have the house empty for 24 hours. This is to ensure nobody is harmed from these chemicals. 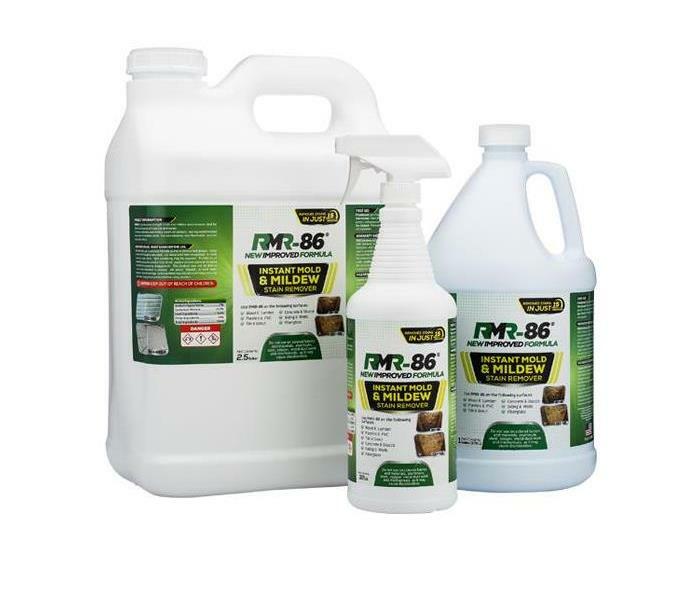 Its a three step process when it comes to these chemicals, 141 which kills the mold, 86 that removes the stains and back to 141 to put a protective shield to prevent any future mold. All this is the best way to get rid of big mold jobs. "Like it never even happened". The ceiling on the main floor the difference can me seen! When it comes to the hard working people of SERVPRO, we be sure when we work we do our best at making sure customers belongings are in the upmost care. When it comes to pack out from a fire job we take our time and put care in making sure the belongings are safe. A fire job done in Downers grove gave the SERVPRO a challenge to see how careful they are during pack out. The customer had smoke damage within her whole house. She also had lots of paintings and fragile belongings in her home. The SERVPRO team was extra careful during all of this. The Customer had flat paint so the smoke damage was heavy on the walls and ceiling. In the end after content cleaning,cleaning walls and cleaning (with sponges and chemicals) and lastly upholstery/carpet cleaning. The house was clean and walls and ceilings looked brand new. It was truly "Like it never even happened". One room in the church that was cut 2 feet! On a Friday night around 6pm, a call came in from a church 15 minutes from the warehouse. Within an hour the whole SERVPRO crew was loading up the equipment for the job. With in 2 hours of the call everyone was working at the job extracting water and removing base from wet drywall. The job was caused by a pipe burst, shooting right though the drywall going though another another wall. In total 14 rooms were affected with wet walls and wet carpet. The job continued with cutting two feet of drywall, removing any wet materials affected by the water. The SERVPRO team went above and behind working past midnight making sure the job is done right. No water was left in the carpet and all walls were treated, ready for drying. A big job for the SERVPRO team but they are always happy to help. The maintenance team express "You guys were so fast and did such an AMAZING job". The damage trees and items all left on curb side in Florida. In October 2018 Hurricane Michael made hit land in the Florida Panhandle. The winds got up to 155 mph, the damage done to this city was devastating. People were with damage or even without homes. Trees, homes, vehicles, anything within the area affected was horribly damaged. Many people and companies from all across america came to help the good people of Florida. Everywhere you looked on the streets were people working. Red cross volunteers giving food and water for people in need. Linemen working to get power back in peoples homes, Tree service trucks removed fallen or damaged trees. Plus many restoration teams from across the country working their hardest to get Florida back on their feet. Many SERVPROs where helping everyone in need. Every street you turned was fallen trees and damaged items on the curb waiting for trash pick up. SERVPROs across the country came together to help in a time of need. SERVPRO is always happy to make a change in this World. The city of Elliott, affected by the flood. In Elliott city, which is 30 minutes from Baltimore, in the state of Maryland. May 2018, the city was hit by a storm that brought over 8 inches of rain within a 2 hour span. Streets were like rivers. The main street of Elliott vanished from the amount of rain given. SERVPRO was quick on the scene. Removing wet drywall and items that were no longer savable. People claimed that this was an "1,000 year storm". Basements of peoples homes were filled with water and left many losing personal belongings. SERVPRO was their to help people in need. Preventing the risk of mold in peoples basements and starting the drying process to many homes. The risk of more floods in the area is big. But SERVPRO will always be there when the great people of Maryland need help. 1/22/2019 - Learning never stops! 1/22/2019 - Mold is hiding. 1/21/2019 - Pipe burst in church. 1/21/2019 - Aftermath of Hurricane Michael.